AFC Leopards are the new GOTV Shield Cup champions after a 1-0 win over cup defending champions and KPL champions Gor Mahia at a packed Nyayo Stadium on Sunday afternoon. Midfielder of the year nominee Peter Opiyo’s solitary strike silenced the green army who hoped for a win to make it a historic double. Ingwe made the first move. Keeper Onyango was forced off his line to make a clearance, he missed thus allowing Noah Wafula steal the ball but recovered fast to head out Wafula’s cross. In the 10th minute, Sserunkuma was fouled by Anthony Kimani to gift Gor Mahia a free kick that Calabar kept low but did not trouble Musalia at goal. Dan Sserunkuma then made two successive attempts at goal in the 12th and 19th minute that clearly showed why he is a strong contender for the player of the year. In the 25th minute, Paul Were was fouled by Donald Mosoti with the resultant nice free kick taken by Abdalla Juma ending up in keeper Jerim Onyango hands. 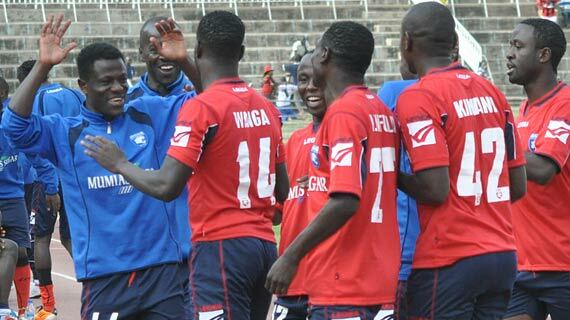 Ingwe fans thought they had made a breakthrough in the 40th minute but Allan Wanga shot ended on the wrong side of the net. With a minute to the break, keeper Martin Musalia rescued Ingwe from a great Anthony Akumu header off a lovely Innocent Mutiso corner. After the half time pep talk, Ingwe came breathing fire. They were rewarded when an easy tap in by Peter "Pinchez" Opiyo of a cross by Noah Wafula gave them the lead in the 53rd minute. A minute later, Paul Were paved way for Oscar Kadenge. With twenty minutes to the end, Coach Bobby Williamson injected some fresh legs in Kevin Omondi and Mungai Kiongera and Edwin Lavatsa who came on for Timonah Wanyonyi, Anthony Akumu and Innocent Mutiso respectively. The next move was a brilliant run by Allan Wanga who passed the ball to an unmarked Oscar Kadenge but the latter’s shot was saved by the keeper. A surprise long range shot by Allan Wanga was met by equal brilliance by keeper Jerim Onyango in the 84th minute as Ingwe upped tempo with a view of putting the game beyond K’Ogalo. Mungai Kiongera almost managed a later equalizer with his perfect header in the 88th minute but keeper Martin Musalia blocked it.